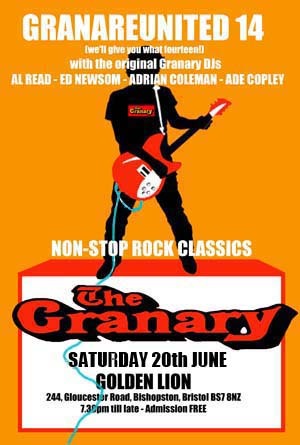 Those of you who frequented the Granary during the Eighties will remember that punk rock was featured alongside the club’s staple diet of heavy rock. Recently Al was interviewed by “Rotten Jonny” of “Punk Globe” internet magazine who also reviewed the Granary book. Please visit the web site to read both the review and the interview and also take time to explore the many interesting features about punk past and present. Al and Ed organise GRANAREUNITED events on a regular basis at the Golden Lion in Bishopston, Bristol. The next is on Saturday 20th June. Admission to these events is free. On display are many Granary Memorabilia showcards. Al Read’s Granary book is on sale as well as the Granary T-shirts. You will always hear many of the classic rock records that were featured at the famous Granary Friday night rock discos.